So, just in case anyone out there thinks this is an idea they’d like to improve upon 😉 here’s how I did it. 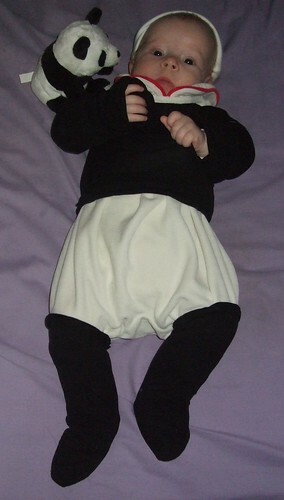 First, you’ll need a white hat and one-piece outfit that both fit the baby, and a pair of opaque black women’s tights. (These last are going to be cut up, so this is how to use up any with holes or runs that mean you can’t wear them any longer. If they’re in particularly bad shape you might need to choose parts from more than one pair.) 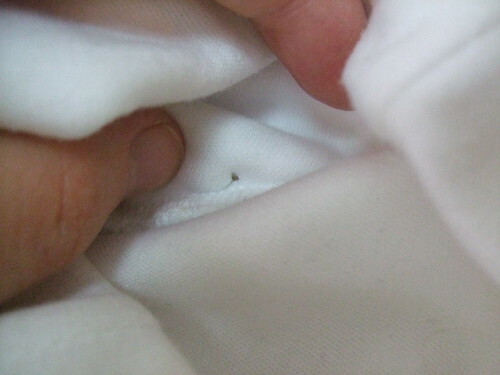 You’ll also need a small sheet of card and some small safety pins. Tools needed are scissors, a glass and a pen/pencil. 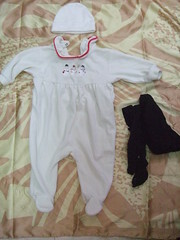 The feet ends of the tights will go over baby’s legs, so measure generously and cut these off. (You can trim later if they’re really too long.) Cut another small piece from each tights leg for the ears, then the remainder will make the black part of the costume body. I forgot to take pictures of these parts but basically you need a large hole in the tights where the two legs join. This will go over baby’s head, with the legs as sleeves. 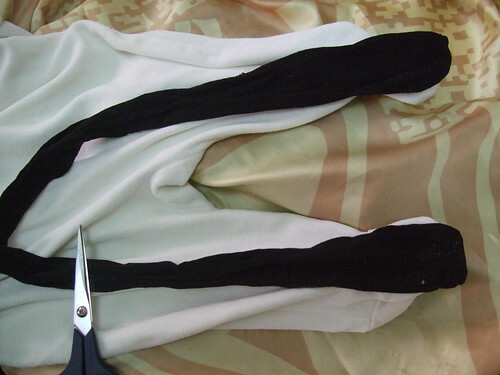 To make the ears, cut two appropriately sized circles out of thin card (I found the base of a small glass was a good size), fold each in half and cover with the small pieces of tights leg you cut earlier. 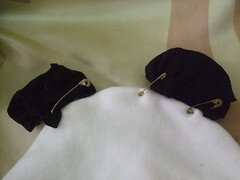 Use the safety pins to carefully attach the ears to the hat at the seams, so that the metal doesn’t touch baby. This is where I’d really recommend sewing, especially since a hat with ears is cute even when not in fancy dress. In that case you wouldn’t want card stiffening, however, as it’s not washable. Still, this way certainly does work. This is the longest stretch of metal I could find inside the hat, and I’m probably going to redo that pin. And that’s it. Now just place it all on the baby. There’s enough friction in tights material that you probably don’t actually need to attach the legs to the main outfit, but if your baby’s already crawling and pulling them up is getting annoying a couple of carefully placed safety pins would probably work there too. There’s a great Youtube video I found awhile back about making baby leggings from adult ankle socks. I was going to follow it up with these pretty socks (actually for a 7 year old child) we were given, since it’s pretty cold here at the moment, but decided that for now it’s easier just to cheat! We turned them upside-down and the heels just about fit at her knees! Running really late tonight for today’s post so I’ll publish now and keep looking for that video to link in later. 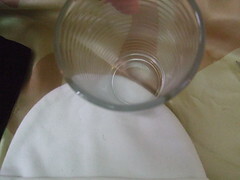 – Found it! Did the embedding work? I feel like I’ve done nothing crafty in months, and despite reading right through both of these books during that time I really haven’t followed up by doing any of the projects taught/suggested in either. That shouldn’t be taken as a reflection on either book, since I certainly thought about doing things from both, but just haven’t really been in the mood so much of late. 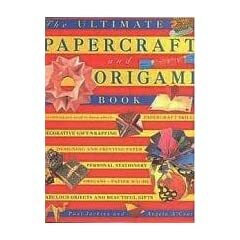 This is a large and long book with lots and lots of fairly simple but very diverse paper projects. Cutting, tearing, folding and sticking skills will all be put to good use in making things decorative, fun and useful. Decidedly a family book (rather than being aimed just at either children or the adult crafter) that I can see enjoying with my little girl in a few years. 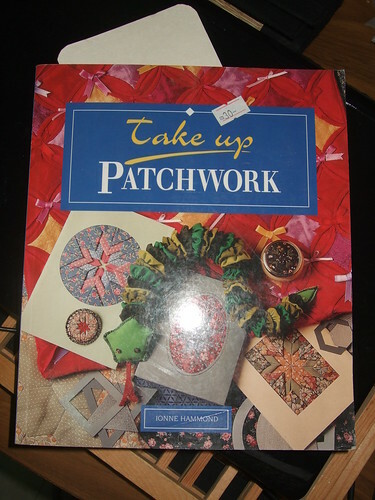 As to the book itself – it includes a variety of small sized projects using a range of techniques, so I imagine making a few of the projects would be a great learning process in sewing generally and patchwork and quilting more specifically. The fabrics and colours in the illustrations aren’t necessarily ones I would choose to use, but then changing those is the easiest possible customisation going! I finished some more repairs last night (sewing ones), but they’re not really good enough to show off, I don’t think. I keep meaning to do a post on pad refurbishment, because it might actually be useful to somebody (there’s lots and lots of online info on how to make new cloth menstrual pads from scratch, but not so much on changing them after the fact), although it’s one of those things where if I can work this out then probably anybody can! I have a few almost-finished books to add to the list, and several there still to write about. I might finish some of the reading over Shabbat, so there’ll be more on those to come. Let’s see, it’s the 27th of August now, so I’m looking good to finish up the month having fulfilled the NaBloPoMo requirements for posting every day. I don’t realistically think I can even try to commit to that for September, October or November, certainly, (rather expecting first the Jewish festivals and then some major life changes to get in the wayalter my priorities) although I will try to keep posting regularly. (I might just stick with some of the more interesting posts, though…) I’ll try not to just disappear (again) anyhow! Hm, to add to the randomness that is this post, I’m evidently confusing Zemanta with all the different topics. Shall I just see can I show you some of the variety of pictures it’s offering me? Apparently not easily. (It seems it won’t let me drag the pictures where I want them on Opera, and thus it just wants to do one, right at the top, where I don’t want it.) 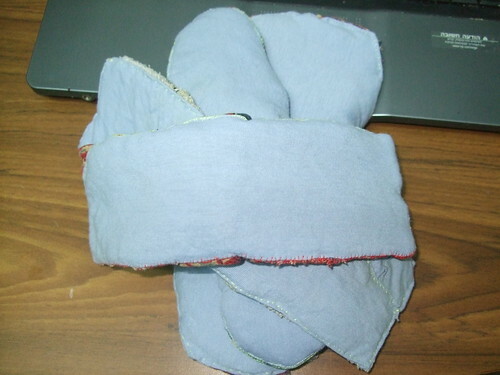 Anyhow, there are a few of cloth pads, several related to Shabbat and its different services, as well as a few completely random ones I can’t work out at all. Anyway, whatever you’re planning on doing for it, have a great weekend! I have so many things I’m wanting to make, even planning to make, and yet it’s weeks since I’ve really done any crocheting, and I’m stalling on doing more than sewing repairs. Maybe the title’s wrong – it’s not that I don’t have inspiration; it’s that I’m not seeming to get around to following up on that inspiration. Ooh look – a Singer sewing machine that reminds me of the one my Granny used. I was a bit disappointed when my mother and uncle decided not to keep that, but then neither of them wanted it, nor did they have space to keep it for years just in case one of their children really would later on. So pretty. If I get a machine (which I do want to) I’m sure it’ll look purely functional. Thankfully they’re all fairly different in appearance (and mostly kept in different places, according to their function and most useful place) so they don’t tend to get mixed up. 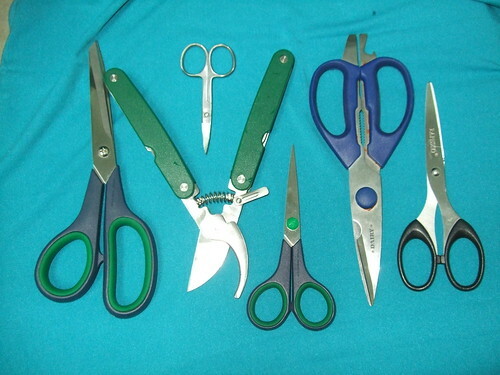 I’m sure most crafters, at least, have specialist scissors which mayn’t be used for anything else – how about the rest of you? Still s-l-o-w-l-y working on the pad refurbishment from yesterday. I have a picture of the four that are done, but am on my DH’s computer right now, so will add it later, when I’m back on my own. Four-and-a-half done, six-and-a-half to go, and then I really should make myself some more, if I’m not sick of this kind of hand-sewing by then. Here’s the thing, my index finger gets sore while sewing, but thimbles don’t help, as I don’t push the needle from the end, but grip it between two fingers and push/pull like that. 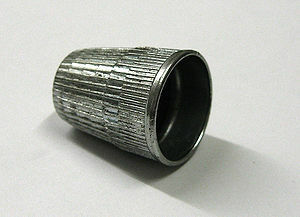 Not sure if this is an error, but I’ve tried using a thimble and didn’t like it. Any ideas? Now to show you some of what I bought today. 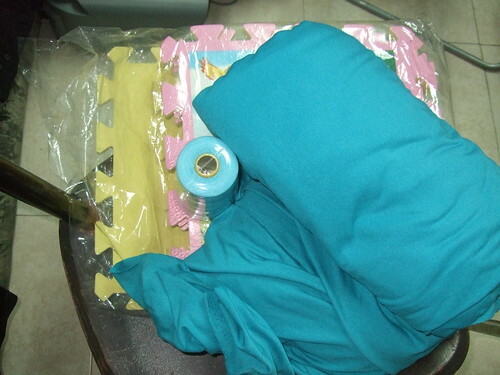 On top, lots and lots of turquoise jersey knit cotton (t-shirt material), for that skirt I mentioned yesterday, and a couple of other things I’ll show you if they work. It cost more than I thought, largely because it is more than I thought, since the fabric comes in getting on for twice the width I was expecting (170cm rather than 1m). I still needed the full length for one of those possible projects, but that gives me plenty of ‘practice’ fabric (my sewing experience is limited anyway, especially with stretchy fabric), and I have ideas for things to do with real leftovers anyhow. Even at more than I expected, and with buying matching thread, the total still comes in at less than buying either of the two main things I’m planning on making with it, plus I get the fun and fit (and frustration, which will still be better than clothes shopping) of doing it myself. Now I just have to get on with it! In a third shop (why would a fabric store sell thread, after all?!) I found some of those jigsaw style playmats (underneath the fabric and thread in the photo above) I’ve seen recommended so many times on Ravelry and elsewhere for blocking with, so we got those too. They’re printed on one side, which I’ll probably try to leave pristine, and use the yellow side for sticking pins in! I’ve started reading the introduction, and it’s well enough written that I might go straight through and put it on the booklist. I still have a few metre squares of (woven, printed, cotton) fabric I bought for making headscarves, that I haven’t done anything with as yet. I suppose I should get to that before I start on other projects (and I’m still at the handsewing stage), but I want to make myself a skirt I browsed my way to online, which may be rather a challenge, especially considering I haven’t so much as made myself the pincushion I think I really need to get on with any other sewing. 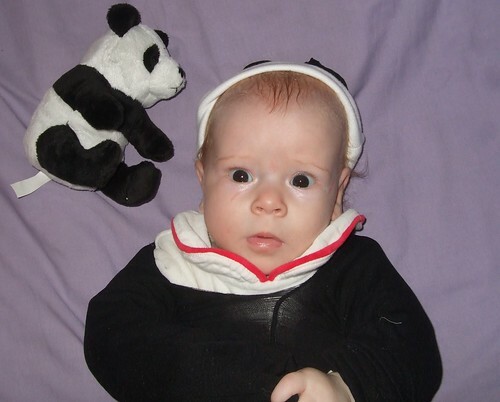 I spent a fair amount of time on Youtube this evening, looking at sewing projects for babies. (Hey, they’re small and easy and the recipient isn’t going to complain about my sewing ability or colour choices!) As I discovered long ago for crochet stitches, Youtube is one of the best tutorial sources (on just about anything) out there, if you’re a visual learner who’s willing to pick and choose.